Your teeth may hurt while you are having a common cold or flu. It may be caused by sinus infection or ear pressure. Read for relief methods. Imagine that you are suffering from a bad cold, or bronchitis or flu. The type of infection can be any but it is severe enough to cause moderate fever with body pain. You also develop runny nose, nasal congestion and sore throat. Now, you realize that along with your achy joints, back ache, body ache, sore throat, runny nose and all other symptoms, your teeth also hurt! Is it due to a cavity or abscess in the tooth or due to cold or flu infection? Let’s find out. Why Do My Teeth Hurt When I Have a Cold: Sinus Infection? Your gum/teeth can ache while you get ill especially if you suffer from sinus infection. The location of the maxillary sinus is close to the upper teeth. While this sinus is infected or inflamed, it may put pressure on the upper teeth. When you suffer from flu or a cold, there is additional pressure in the head, which is sometimes translated into toothache. The sinuses may also cause ache in the lower teeth. This happens because of referred pain, where problem present in one area results in pain in a different area. Teeth may also be forced into little “off” positions due to swelling of sinuses resulting in the bite to feel different. Due to this you may clench down leading to pain related to grinding. This answers the question, why do my teeth hurt when I have a cold. Evaluate the quality of pain that you are suffering from: Pain that is coming from the sinuses will be felt more like a dull ache. Moreover, it typically radiates and spreads through a wide area of the face and mouth. 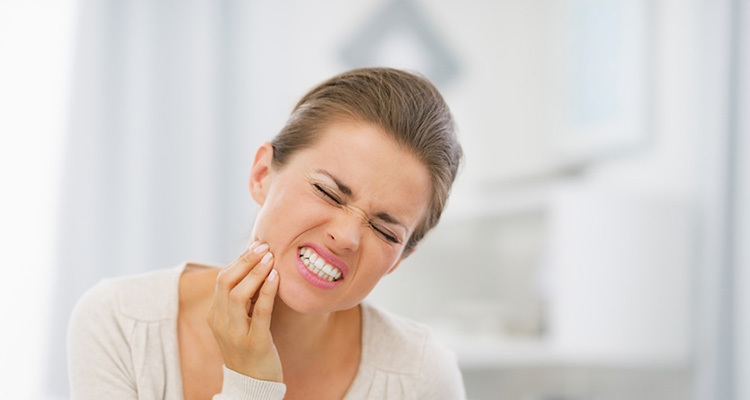 On the other hand, a decayed or an abscessed tooth will more likely present itself as a spot-specific and sharp pain. In case you suffer from allergies, consider their flare up as the cause behind your pain: Check for the presence of allergens in your environment/routine life. Check for the symptoms of sinus infection that are mentioned below. Visit a dentist and get a dental examination: X-rays may be taken of your sinuses and jaws to obtain a clear picture of your jaws and sinuses. A sinus infection may be treated with antibiotics, nasal spray or decongestants. The infection may also get better with time on its own. On the other hand, pain in tooth that is caused due to an abscess or cavity does not get better on its own and requires immediate treatment. How to Relieve Tooth Pain Due to Cold? Drink lots of fluids and stay hydrated. Take steam so as to loosen mucus present in nasal passages. You can lower your head on a large bowl of steaming, hot water or take a hot shower. Consume spicy foods as they loosen mucus and can help in clearing the sinuses. Try to hum at varying tones. This helps in reducing inflammation of the sinuses. It also relaxes you and helps you sleep. Elevate your head while lying down to drain your sinuses. You can use an extra pillow to do that. If your pain in tooth is not relieved by trying these home remedies, take professional help. It is possible to relieve pain in tooth that is associated with sinus infection or common cold. Practicing good habits of oral hygiene including brushing two times in a day, flossing your teeth once every day and rinsing your mouth using an antibacterial mouthwash such as Smart mouth will all help in relieving toothache related to sinus infection. Furthermore, eating healthy and well balanced diet strengthens your immunity and also improves the body’s ability to fight with germs faster. In case you develop toothache due to sinus infection you should consume softer foods and avoid eating foods that are too hot or too cold. Doctors often prescribe antibiotics along with antihistamines for sinus infections. Why Do My Teeth Hurt When I Have a Cold: Ear Pressure? Pain in tooth can also result from increased pressure in the ears. Inflammation present in the ears which can be either due to excess fluid accumulation in the ears or infection in the ears can apply pressure and cause pain and discomfort in the back molar teeth. There have been cases when patients have scheduled urgent doctor visits fearing serious trouble with their back teeth, when actually; the increased pressure in their ears has been causing the pain in their teeth. When you are suffering from a common cold or sinus infection, it is recommended that you remove the excess pressure in your ears by either taking over-the-counter cold and flu medicines or blowing your nose. The most important factor in relieving your infection is to take adequate amount of rest and stay hydrated by drinking plenty of fluids. Gradually, most of these issues would be resolved.